Feb. 10, 2017, 10:46 a.m.
By Ricardo Bilton @rbilton Feb. 10, 2017, 10:46 a.m.
How do you get your reporting about a public health issue to more people when a significant percentage of your audience doesn’t have consistent access to the Internet? For two news organizations in Chicago, the answer involves texting, in-person events, and, yes, even print. The two groups have worked together before, launching projects such as the Public Newsroom, which each week brings Chicagoans together to collaborate on community news projects, share ideas, and participate in workshops. The two also worked together to report series on the 911 system in Chicago and efforts to spur economic development in the city’s neighborhood of Chatham. But covering these issues for the low-income neighborhoods of Chicago’s south and west sides opened up some unique challenges for reporters. Many of these neighborhoods have much lower rates of home broadband access than the city as a whole. 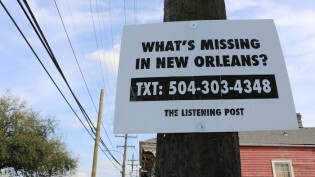 This reality convinced City Bureau and South Side Weekly that they needed to experiment with different ways to get information out to residents. 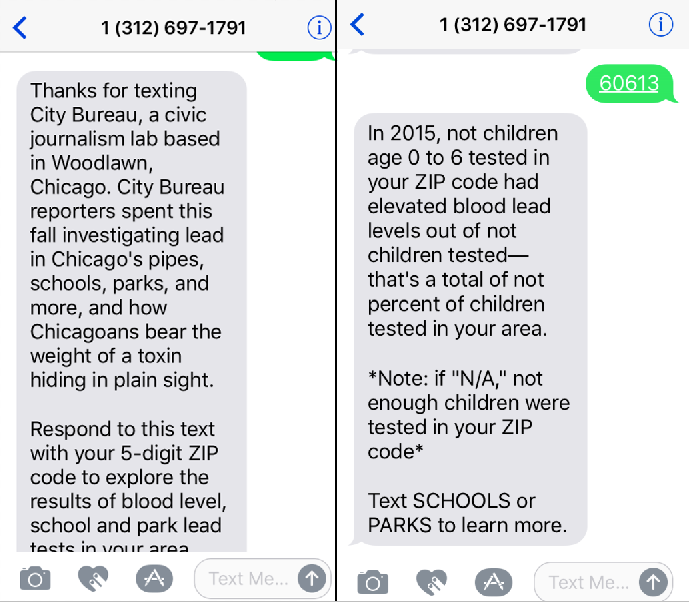 As a part of the Living with Lead effort, the groups created a texting tool that shared relevant local lead information (such as lead levels in the water in local parks) when residents texted “LEAD” and their ZIP code to a dedicated number (312-697-1791). So far, more than 300 people have texted the number looking for the data. “We knew we couldn’t focus solely on the [desktop] Internet when the community that we’re trying to engage with might not have great digital penetration,” said Darryl Holliday, editorial director of City Bureau. Beyond the mobile component of the lead project, South Side Weekly and City Bureau also wanted to build a physical layer on top of their lead coverage. Over the next few months, the organizations plan to hold open events at public libraries in Chicago to both collect the stories of residents affected by lead issues (via a partnership with StoryCorps) and to extend the reach and longevity of their reporting. 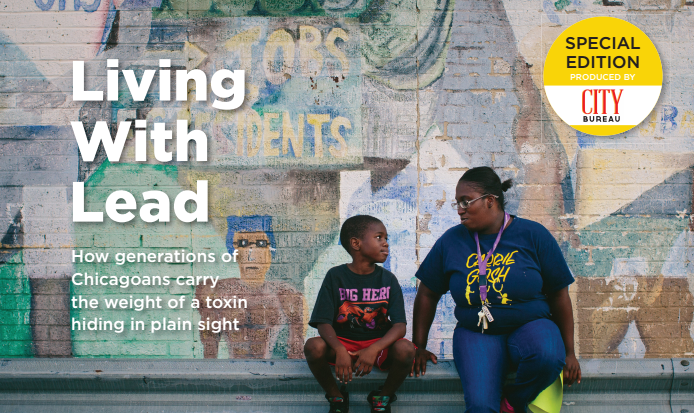 For City Bureau, Living With Lead is an extension of its mission to cover the marginalized cities of Chicago that are likely to feel the brunt of social problems. These communities, which Holliday said are often “the canaries in the coal mine” on social issues, are often underserved by larger news organizations. South Side Weekly, in contrast, approaches stories by writing directly for the affected communities. 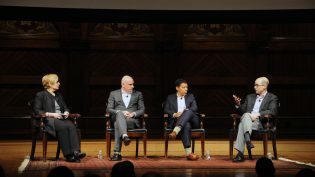 During a panel discussion at Harvard University earlier this month, Lydia Polgreen, editor-in-chief of The Huffington Post, said that, among other things, journalism “needs to rediscover its roots as a blue-collar profession, and find a way to get back in touch with empathic storytelling.” She argued that while national news organizations spent a lot of effort writing about Trump voters, for example, they spent considerably less writing for those people. This idea — writing for a community, rather than simply about it — is fundamental to the missions of South Side Weekly and City Bureau. “We’re trying to empower folks to make their own decisions, and that requires that we get them the right information,” Holliday said. POSTED Feb. 10, 2017, 10:46 a.m.
Bilton, Ricardo. "In Chicago, two news orgs are using texting and live events to widen the reach of their reporting on lead." Nieman Journalism Lab. Nieman Foundation for Journalism at Harvard, 10 Feb. 2017. Web. 25 Apr. 2019. Bilton, Ricardo. "In Chicago, two news orgs are using texting and live events to widen the reach of their reporting on lead." Nieman Journalism Lab. Last modified February 10, 2017. Accessed April 25, 2019. https://www.niemanlab.org/2017/02/in-chicago-two-news-orgs-are-using-texting-and-live-events-to-widen-the-reach-of-their-reporting-on-lead/.